A dual faced town clock affixed to an iron support, on the right of the support is a bronze plate. 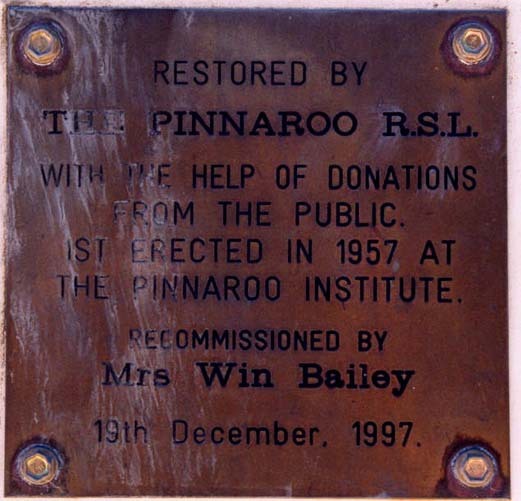 RESTORED BYTHE PINNAROO R.S.L.WITH THE HELP OF DONATIONSFROM THE PUBLIC.1ST ERECTED IN 1957 ATTHE PINNAROO INSTITUTE.RECOMMISSIONED BYMrs Win Bailey19th December, 1997. 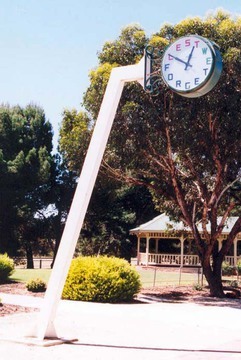 DESCRIPTION: A dual faced town clock affixed to an iron support, on the right of the support is a bronze plate.